“Double chin” can affect both men and women. Aging, genetics, and weight gain can all influence double chin. Similarly, it is often resistant to diet and exercise. Kybella The Woodlands is the only FDA-approved injectable treatment that contours and improves the appearance and profile of moderate to severe fat below the chin. When injected into the fat under your chin, Kybella destroys fat cells. Once destroyed, those cells cannot store fat. As a result, after your desired aesthetic result is achieved, you should not need more treatment. If double chin bothers you, making you unhappy, self-conscious, or embarrassed, consider Kybella to get rid of that fat and fullness. You may feel the heavy chin makes you look older or heavier than you actually are, and you don’t want to have surgery. Even eating well and exercising can’t make that fat go away. Results are visible in two to four treatment sessions, at least one month apart. You may need up to six treatments. Dr. Nangrani will plan your Kybella The Woodlands, including how many treatments you need based on the chin profile you want and the amount of fat under your chin. Everyone’s chin profile is different, so the number of treatments varies from patient to patient. 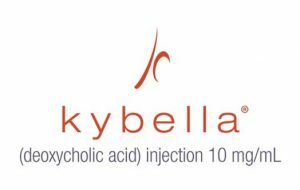 The active ingredient in Kybella is deoxycholic acid, a natural molecule that helps break down and absorb dietary fat. When injected into the fat beneath the skin, Kybella destroys fat cells, resulting in a noticeable reduction in fullness under the chin. Call now for your complimentary consultation, and lose that double chin! You are our top priority at Vedas in The Woodlands, Texas. Our North Houston office is only 10 minutes from I45 and a step off The Woodlands Parkway. We offer you a free consultation for personalized information on Kybella The Woodlands. Come get acquainted with Dr. Nangrani, our board-certified Medical Director. She has practiced for over 15 years. Please call our office to schedule your consultation.